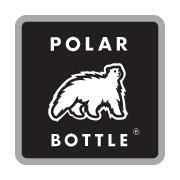 The Polar Bottle® Insulated Sport Water Bottle is a BPA free, Made in the USA, portable water bottle. Minimize your carbon footprint by utilizing a long lasting water bottle instead of the disposible water bottles. Also much better for your health as the BPA in the plastic water bottles can leach into your water which is not good for you. The founders wanted to develop a water bottle that stayed cold on their biking journeys. You know how water bottles tend to sweat, and by the time you get to the bottom they are typically lukewarm. So much more refreshing to have cold water at the end of your journey! I chose to review the Ergo Insulated Water Bottle, which had a huge selection of patterns! These are beautiful to go with any style you like. I chose the Flower Candy water bottle. The half twist lid keeps the liquid secure while biking, jogging or just packing it in your bag. Because of the outer layer of the bottle, they will look duller in real life than they do in the picture. The pictures above are my water bottle, the one below is from the website. Keep that in mind when ordering. In additon to the Ergo water bottle they also have their original Polar Bottle Sport for a sleek, light weight bottle to take on the road with you. These come in 20oz and 24 oz insulated bottles. I love how they have Kids Insulated Water bottles as well. I know I can get my kids to drink water much more in the summer if they have their own, fun bottle to drink from, especially when it is nice and cold. I am off on a road trip today and my polar bottle is in the fridge ready for my journey. With temps reaching near 90 today, I am thankful to have a nice cold insulated water bottle! Cute water bottle, I hate the fact that they look duller though. Great review. Thanks for the tip of how the pattern will look in real life as opposed to the picture! these are very pretty... considering the warmer weather has arrived these are great to have on hand since it's important to keep hydrated and drink something cold when you are hot... very good review!